Attention all wood turners and friends! AAW hopes you have received their email with the Preliminary Symposium Schedule and rotations. This is the information you need to be able to volunteer time to assist with making the symposium a success. Now you can register on line to schedule your volunteer time. AAW is asking for volunteers to staff the registration activities. The event runs July 11-14 at the convention center in downtown Raleigh. Volunteers do not need to be attendees or members of the AAW. Bring your spouses, friends, neighbors and have a good time. 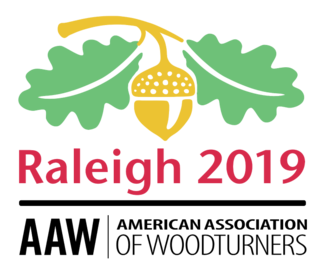 The AAW is offering a chapter group discount for the 2019 AAW Symposium, in Raleigh, NC, July 14-17, 2019. The offer is for AAW members only and extends a savings of $25 off the $325 symposium registration with a minimum of 10 early registrations. Chapters that elect to participate will also receive one complimentary reserved table at the Saturday evening dinner (dinner tickets are separate). Members that want to participate must bring a check to the March 14th WGNC meeting for the full amount. There will be a sign-up form available (see below) and collection of the checks. Checks will be the only form of payment accepted -- no credit cards. Make checks payable to: American Association of Woodturners. For any additional information or questions, contact Ted Ross. WGNC members in good standing get several benefits, including the ability to borrow from our extensive collection of woodturning DVDs and books. But with only a few minutes in the meeting to peruse the cabinet, it can be hard to plan your viewing needs. Well our new librarian Robert Edmiston has a solution. You can now download the complete list of library offerings and decide what you want to borrow before the next meeting. Just be sure to pick out some back-up choices as there is no guarantee someone hasn't beaten you to your top picks. A radial arm saw has been donated to the club and will be auctioned off at the end of the meeting Aug. 10. Minimum bid is $25 for this handy tool. It is a Sears Craftsman product, tabletop model number 113.29402. We will not bring it to the meeting, but instead make pick-up arrangements with the wining bidder. WGNC is happy to offer new T-Shirts promoting the club. These sand-colored cotton tees bear the club logo fully emblazoned across the back with a smaller version where a pocket might be. As turners, we decided it was best to forgo the shavings-collector. The shirts are available in Medium, Large, Extra Large and XXL. They are available to members for $12 each ($14 for the XXL). You can order them here and pick them up at the next meeting. Or you can just bring your cash, check or credit card to the meeting and make your purchase there. 2015 gallery books on sale at $45!